Thornton won by 23 runs. Triangle 6 pts, Thornton 12 pts. Bowling: J Hutchinson 12 2 66 5, R Parr 13 2 74 0, M Clayton 5 0 40 1, G Soames 8 0 44 2, R Carnall 6 1 27 1. Sowerby Bridge won by 4 wkts. Queensbury 3 pts, Sowerby Bridge 12 pts. Booth won by 9 wkts. Booth 12 pts, Copley 2 pts. Bowling: U Saghir 10 4 28 1, O Collinge 14 1 49 2, I Sharkey 3 0 22 0, M Ayub 9 2 28 3, Rich Laycock 8 3 29 4. Bowling: I Hartley 7 1 29 0, O Thorpe 5 0 26 0, C Dennison 5 0 29 0, F Hammond 2 0 10 0, C Goulden 2 0 14 0, M Seraj 7 2 26 0, G Walker 3 0 24 1, M Barker 2 0 6 0, N Gomersal 0.4 0 12 0. Jer Lane won by 3 wkts. SBCI 5 pts, Jer Lane 10 pts. Bowling: N Chowdrey 11 2 65 2, A Winnard 6 0 35 0, S Collins 17 0 78 3, J Lister 11 1 74 1. Bowling: J Sykes 10 1 58 1, R Hanson 9 0 33 1, R Benson 6 0 34 0, T Wood 13 0 76 5, T Conway 4 0 29 0, M Scholefield 2 0 12 0. 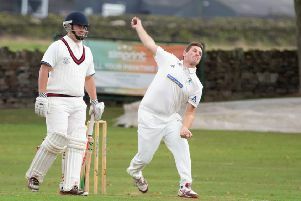 Blackley won by 2 runs. Mytholmroyd 6 pts, Blackley 12 pts. Bowling: A Azam 8 4 12 0, N Harris 9 1 38 3, Z Mahmood 12 2 59 5, D Murgatroyd 9 0 71 1, J Cowens 6 0 35 0. Bowling: B Pedley 10 1 47 2, C White 13 3 57 1, J Watson 3 0 26 1, D Peel 14 0 69 5, R Jennison 5 0 24 1. Bowling: G Kinsey 9 1 60 0, R Keywood 7 1 37 0, D Syme 10 2 54 4, G Keywood 12 0 84 1, J Whitworth 3 0 15 0, F Khatana 4 0 39 1. Bowling: I Gledhill 9 1 44 2, D Griffiths 12 1 66 3, D Crossley 9 1 55 2, M Mohammed 9 1 64 3. Bowling: A Buckley 13 0 92 1, J Firth 17 1 111 2, S Moody 3 0 27 0, P Fisher 4 0 33 0, R Beaumont 6 0 47 1, L Broadbent 2 0 20 0. Bowling: S Gardner 11 1 50 0, H Talbot 14 2 74 5, M Gardner 6 3 17 3, R Saghir 8 0 45 0, A Kaushik 5 2 22 0. Oxenhope won by 58 runs. Bridgeholme 5 pts, Oxenhope 11 pts. Bowling: S Mahmood 9 3 47 2, O Davy-Day 12 2 67 0, N Ali 8 0 39 1, O Challis 5 1 36 1, J Hudson 4 0 42 0, Y Mahmood 2 0 18 0, B Fielden 5 1 55 3. Bowling: S Mawer 10 0 37 0, N Storton 7 3 15 4, L Dyson 15 0 103 1, D Tetley 13 0 102 3. Low Moor won by 8 wkts. Ludd Foot 3 pts, Low Moor 11 pts. Bowling: M Stokes 10 2 35 1, S Waheed 11 2 51 2, N Wood 7 2 25 0, M Jenkins 9 0 60 3, R Dowling 5 0 17 2, M Haley 3 0 15 0. Bowling: J Stott 6 1 26 0, I Baldwin 5 2 22 0, T Hosker 11 0 62 1, O Hemingway 12 3 43 1, O Bairstow 3 0 23 0, G Hall 3 0 32 0, O Hosker 2 0 17 0. Bowling: M Mistry 13 1 54 1, P Gelder 19 5 65 3, N Bickers 13 1 57 0. Bowling: J Khan 15 1 68 3, A Asghar 17 4 58 1, S Mahmood 7 2 23 1, H Butterworth 4 0 26 0. Denholme Clough 230, Old Crossleyans 221. Outlane won by 27 runs. Cullingworth 5 pts, Outlane 12 pts. Bowling: A Blagborough 6 3 17 0, S Ainley 8 0 41 1, J Wrigley 10 6 35 0, A Shaukatt 13 6 26 6, A Westwood 6 0 22 2. Bowling: P Poole 7 0 21 0, G Rankin 14 2 37 2, B Burkill 2 0 22 0, C Welch 13 1 77 5, D Robinson 7 2 19 3. Shelf won by 15 runs. Upper Hopton 6 pts, Shelf 11 pts. Bwling: R Ramsden 12 1 46 1, N Armitage 12 1 42 0, S Priestley 11 1 69 3, L Butterfield 2 0 20 0, C Roberts 8 0 48 3. Bowling: M Jordan 7 4 11 8, H Syed 7 1 18 2. Bowling: M Mahboob 3 0 21 1, K Hutchinson 3 0 13 0.